Certain types of collie (for example Rough Collies, Smooth Collies, Shetland Sheepdogs and some strains of Border Collie and other breeds) have been bred for many generations as pets and for the sport of conformation showing, not as herding dogs. These types have proved to be highly trainable, gentle, loyal, and well suited as pets. Their gentleness and devotion also make them quite compatible with children. 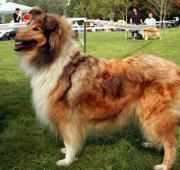 They are often more suitable as companions than as watch dogs, though the individual personalities of these dogs vary. The temperament of these breeds has featured in literature, film and popular television programmes. The novels of Albert Payson Terhune celebrated the temperament and companionship of collies and were very popular in the United States during the 1920s and 1930s. More famously, the temperament and intelligence of the Rough Collie was exaggerated to mythic proportions in the character Lassie which has been the subject of many films, books and television shows from 1938 to the present.